Over the last 10 years, scooters have transformed themselves from being mundane vehicles with a clear focus on utility to more sporty two-wheelers capable of eliciting excitement. Case in point being the Aprilia SR 150 and the TVS Ntorq. We’ve been lucky enough to ride and test some of the fastest scooters that you can buy. And the best part is that they are all available at a price most of us can afford. So let’s get on with it and take a look at the fastest scooters you can currently buy. The Jupiter has been one of our favourite scooters mainly for its versatility and its refined 110cc motor. But refinement isn’t just its strongest suit as it is quite a performer as well. The 109.7cc air-cooled engine makes 8PS at 7500rpm and 8Nm of torque at 5500rpm, which is more than enough juice to make it the fifth fastest scooter in the market today. 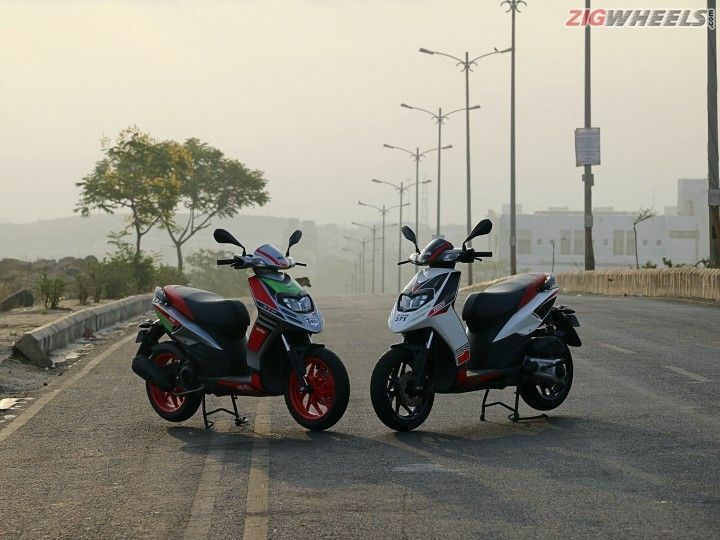 The latest 125cc scooter from Honda, the Grazia is powered by the Activa 125’s motor. The 124.9cc engine puts out 8.63PS at 6500rpm and 10.54Nm at 5000rpm. Our acceleration runs show that the Grazia is faster than the Activa, making it the second quickest 125cc scooter we’ve tested. The faster 0-60kmph time is due to the fact that the Grazia is 1kg lighter than its popular sibling. This is the second scooter from TVS to feature on our list and certainly won’t be the last! The Wego is almost half a second quicker than its larger sibling, the Jupiter, in the 0-60kmph dash. The reason for that is that the 109.7cc air-cooled motor on the Wego makes 8.4Nm of torque, which os 0.4Nm more than the Jupiter. Both scooters produce a similar power output of 8PS at 7500rpm though. Yes, the Wego is one of the highly underrated scooters currently on sale. Looks like TVS is on a roll right now. It’s newest and fastest offering is powered by a new 124.79cc 3-valve engine good for 9.4PS at 7500rpm and 10.5Nm at 5500rpm. It is almost one-and-a-half seconds faster than the Grazia, which is a surprise considering it weighs 9kg more, has a larger 12-inch rear wheel and makes slightly less torque. The TVS Ntorq is undoubtedly one of the sportiest scooters you can buy today. With a 0-60kmph time of 7.21 seconds, the standard version of the Aprilia SR 150 should technically be the second fastest scooter on the list. But we are discounting it as both the SR 150 and the SR 150 Race are the same save for altered CVT gear ratios. And what a difference it makes! The SR 150 Race is 0.3 seconds faster than the standard variant. Its larger displacement works in its favour as the 154.8cc motor makes 10.4PS at 6750rpm and 11.4Nm at 5000rpm. These figures are good enough for the SR 150 Race to be 0.76 seconds faster than the Ntorq. In fact, it is quicker than the 125cc Honda Shine SP as well! This makes it the sportiest scooter you can buy right now.